I had a productive Sunday in my creative space. I was working on a major project and had to get things in order. It was such a disaster, I couldn't think. I cannot work in chaos. I got lots of projects done, addressed a stack of Halloween cards, birthday cards and an anniversary card. I'll share some of them in the coming weeks. 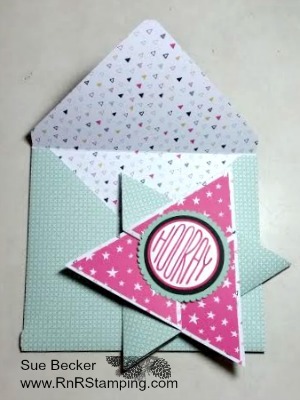 Because I had such a challenge uploading my Star Fold tutorial and wound up posting it late, I thought I'd give you another sample using this great fold. For the base on this card, I again used DSP. 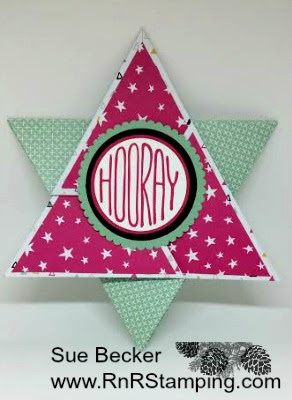 If you prefer cardstock, Stampin' Up! does have 12" x 12" cardstock available in the annual catalog by color family. There are two sheets of each color. The holiday catalog also has a package of Real Red (141982), a package of Cherry Cobbler and Garden Green, ten pieces of each color ( 141992) and a package of Basic Gray and Pumpkin Pie (142023). If you do a lot of scrap booking, this is a great time to purchase some of you favorite colors. 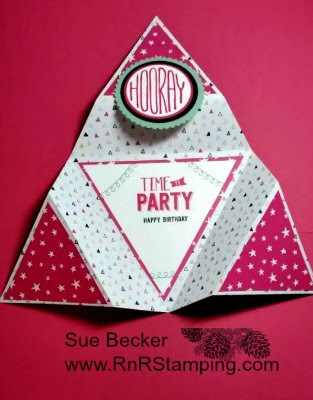 The Confetti Celebration stamp set helped me finish off this fun fold. The finished card measures 6" x 7", but finding an envelope is no worry. Simply break out your Envelope Punch Board. For my envelope, I used a matching piece of DSP for a festive delivery! Be sure to sign up to have my posts sent directly to your mail boxor. Simply enter your email address in the field to the right or stop back later in the week to see what else I was up to over the weekend. I love to hear from you! Please leave your questions or comments.